Commonplace is an original universe centering around magic, trust, storytelling, science, power, and love. In a world where magic is generated from collective human energy, cities are dangerous places to live. The concentrated stress, excitement, and emotion of everyday life can trigger electrical storms and unpredictable transformations – or fuel those who can tap into the magical field. But the magic isn’t the only power at play. It chases stories the way people chase the magic. Storytellers and artists are the most likely to survive; performers and writers can tempt fate in their favor. It’s no coincidence that the arts district has the lowest number of magical emergencies every year. Read more about Commonplace on the blog. Character design comparison for Tris and Pointes, from early concepts circa 2014 to ‘Flickering’ (2016). An anxious and excitable magic-researcher, Pointes spends her free time storm chasing and conducting experiments on whoever will sit still long enough for her to take notes. She’s convinced that if the magic has enough of a personality to like stories, it must have enough person-hood to communicate with – and if she can communicate with it, she can make friends with it, and make the city safer. Unfortunately, research funds are short for a ballet girl in the arts district. If Pointes can get the attention of the Queen, then maybe she’ll have the resources necessary to figure out where the seat of the magic is – but government assistance comes with government oversight, and Pointes isn’t sure she can make friends with the magic if she has an audience. Costume design sketch for Tris. The opera theater is a special place – the high levels of adrenaline, concentration, and energy can attract danger, but the creativity can be quite literally magical. An ex-princess with trust issues and poor impulse control, Tris is transparently masquerading as a stagehand at Paris Street Playhouse. As far as she is concerned, Her Royal Highness Triste Jayes never existed, and at least Pointes and Scratch let her keep up the fantasy. Unofficially speaking, the whole city knows she’s there. Queen Maeve put out that her daughter was getting to know her people before taking the throne. Tris is aware she’s being tolerated and hates it, but nobody has tried to put her back yet. Tris’s twenty-first birthday is coming up quick, though. And Maeve’s schemes always play out just the way she wants them. 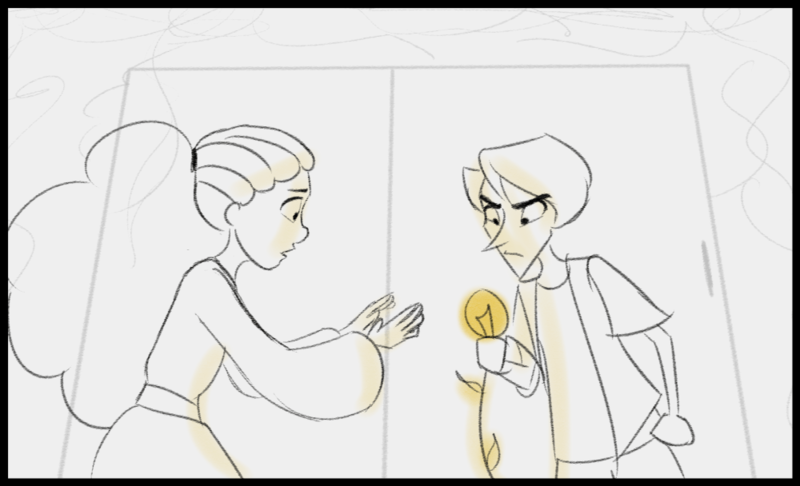 L-R: Pointes, Tris, and Scratch encountering stray magic in the train tunnels. Pointes’s foster sister Scratch wants to have fun, sing opera, and keep her family safe. A performer from a family of performers, she’s used to working with magic the old way: tell it a good story, and hope for the best. Pointes’s direct, scientific approach worries Scratch to death, but she’s not about to let Pointes go out and get hurt on her own. HRH Nim Jayes, Crown Princess of St. Jude, and present Queen of the Fairy Court. Tris and Nim, after getting caught on an adventure. Queen Maeve did have two daughters, although it took Tris’s desertion for her to make any active use of the second. Newly-Crown-Princess Nim was assigned an internship at the fairy mafia for a crash course in governance, and it was only a month before the current Don had been mysteriously murdered. Consigliere Nim agreed to act as the interim Don(na) to prevent a power vaccuum, on the advice of her mother. Now Nim is ready to take over the city whenever the Queen is ready to let her. But with her front-seat view of the city mechanics, Nim has become acutely aware that she would really rather stay an advisor. If she can just get Tris back on the throne, Nim can go back to being the organizing power behind it. Player image of Bianca for a Twine game. Lady Bianca Arden – valedictorian graduate of Pax Academy, programmer extraordinaire, daughter of inventor and Captain of the Guard Tony Arden – is the picture of success. She has a rewarding career as a city guard, her cousin Rosh is following in her footsteps, and the robot she built with her best friend is learning more and more every day. Then her father is killed, her uncle is implicated, and she’s banned from investigating. Not that that will stop her – she and Rosh will get to the bottom of the case somehow. Surely two detective Ardens together can stand up to whatever social pressures are hushing up the murder… but then Rosh falls in love with some arts district nobody who thinks she can control the city magic. Bianca and Lissy get their senior project on her feet. Lissy is a bit of a mystery: nobody’s exactly sure how she managed to become the city’s most sought-after medical professional within a year of graduation. But she’s the best, and so the royal guard, the fairy mafia, the actors, the workers, the families, the ambassadors all trust her. It’s said Lissy knows more of the city’s secrets than the Queen – but you can barely get a smile out of her, let alone a word. Whatever Lissy knows is safe with her. And that includes a certain senior project. Tien, product of Bianca’s programming and Lissy’s uncanny biophysical knowhow, has taken her first steps out of case-study-hood and into the Paris Street dance school. Circumstances at Bianca’s house weren’t great for an impressionable robot. Lissy, to be fair, isn’t much chattier (she and Bianca understand each other), but at least her family isn’t murdering each other. Tien has decided this is entirely too complex for her still-developing emotional intelligence, and tends to focus on the theater. (She’s one of the dancing dolls in Les Contes d’Hoffmann in September.) Lissy is keeping an eye on this, to see what the magic makes of a created thing that still generates creativity. 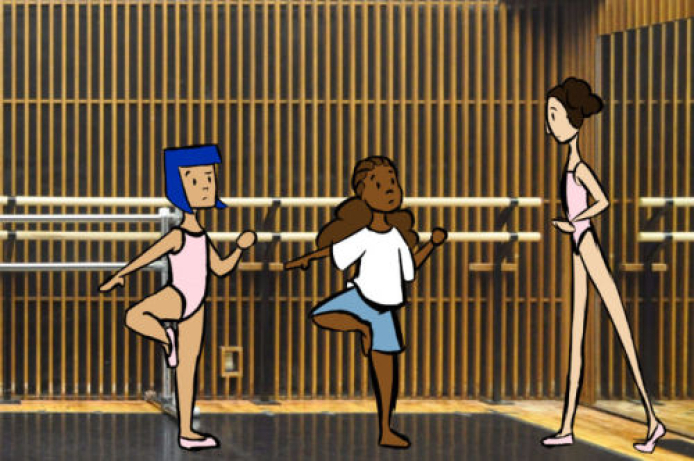 Young Pointes meets Scratch for the first time in a ballet studio. Watch on Vimeo. Now an adult, Pointes escapes from danger with Tris and encounters the city’s dying magical catalyst. If the magic were bound to Tris’s high energy, Pointes could observe it at her leisure… but Tris and the magic itself have different plans. Watch on Vimeo.